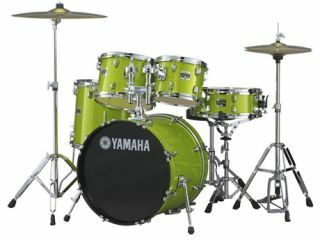 NAMM 2011 PRESS RELEASE: Yamaha Drums will introduce a new series of GigMaker drum sets at Summer NAMM 2011. Though geared toward first-time players, the kits feature Yamaha hardware with hex tom ball joints for precise positioning along with five new eye-catching glitter wrap finishes. "With professional features at an affordable price, GigMaker is the go-to drum set for beginner and intermediate players alike who need an entry-level set but don't want to skimp on quality, tone and playability," said Dave Jewell, marketing manager, Yamaha Drums. In addition to the matching wood snare drum and Yamaha's double-braced hardware, the GigMaker drum sets include matching wood bass drum hoops for superior tone and durability, and come in 20" and 22" configurations. The new kits, constructed with basswood and poplar shells, are available as shell packs, complete configurations with hardware, or packaged complete with Paiste 101 cymbals.